Hi sweet Friends! 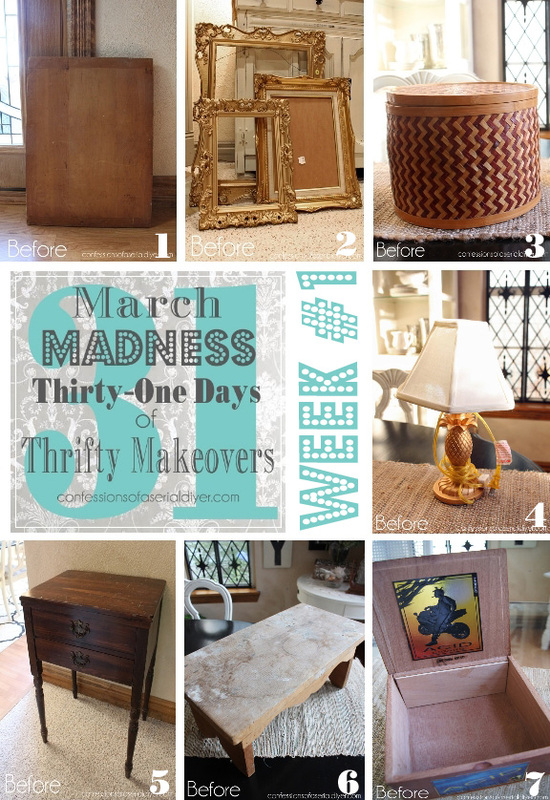 I can’t believe it’s day #28 of my thrifty makeover series! 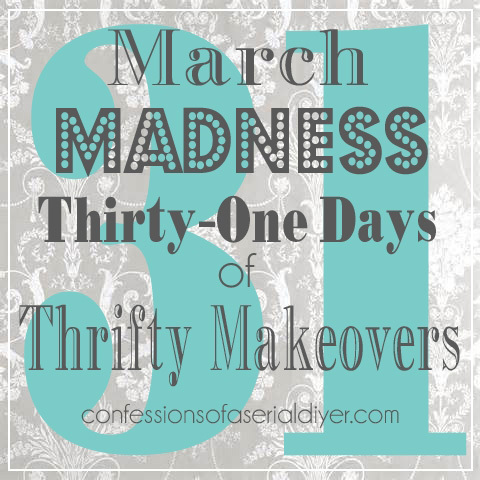 That’s a lot of makeovers, ya’ll! 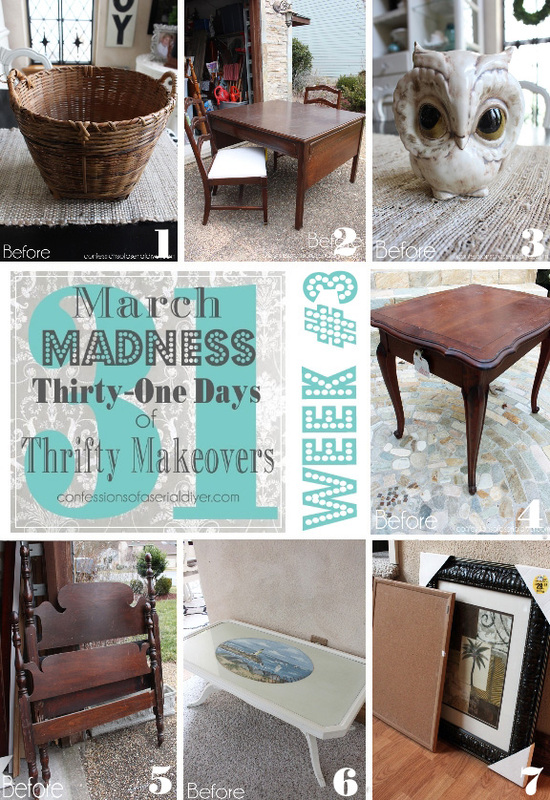 If you’re just joining us, you missed a fun month of thrifty goodness. Not to worry though, you can catch up at the bottom of this post! 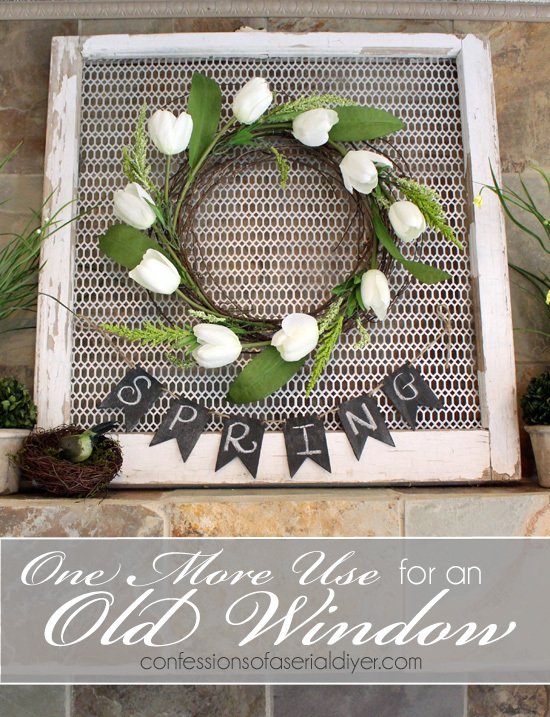 There are so many creative uses for old windows, and today I am sharing one more use for them. It was looking pretty sad. 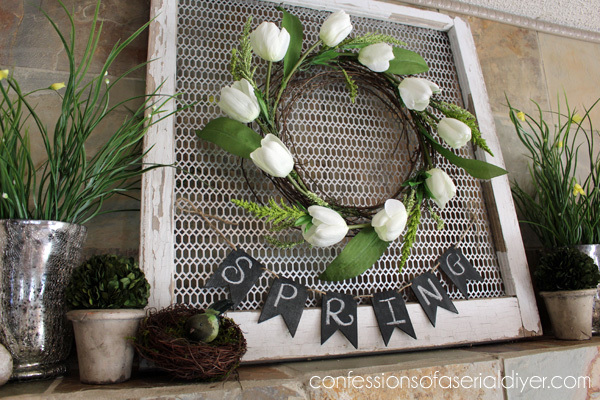 If you’ve seen my Spring Tulip Wreath and Mantel from last year or my Christmas wreath and mantel from this year, then you’ve probably seen this used as a backdrop already! It was such a cool redo that I thought it deserved a spotlight of its own. I removed the clam shell extravaganza and lightly used a wire brush to remove any flaking paint. We used the metal grate for a project years ago and had a bit left over. 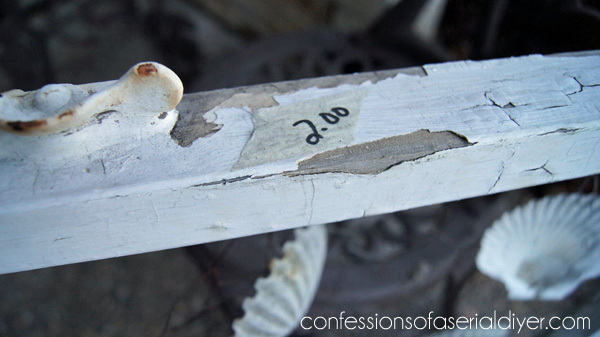 I cut it to fit with metal snippers and staple gunned it to the back of the window. It makes a great backdrop for a wreath! 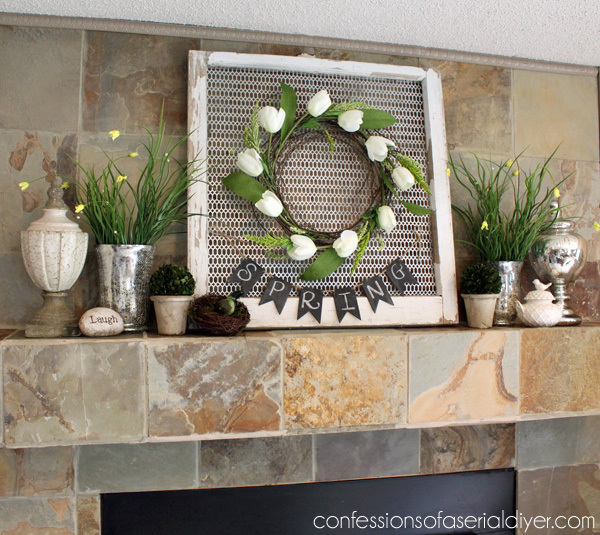 These pictures are from my Spring mantel last year. 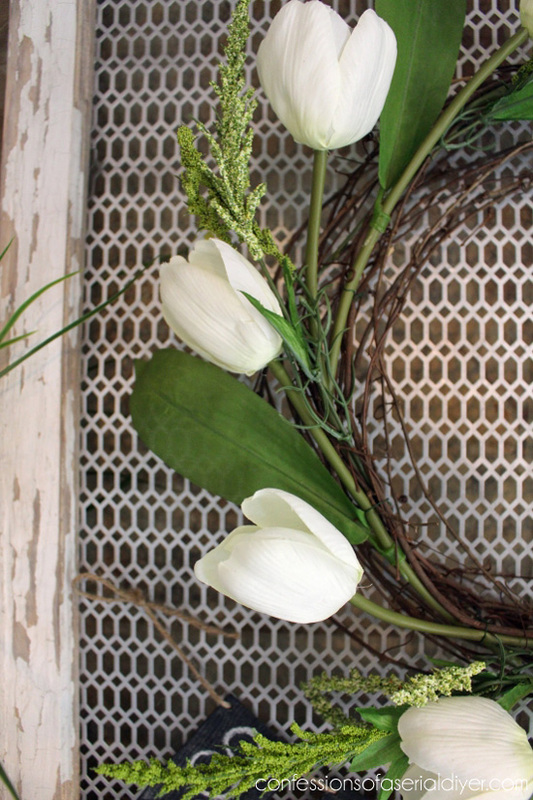 I shared how to make this simple Spring Tulip Wreath in that post. This was a spice cabinet I built to hang on the end of my kitchen cabinets long before I painted my kitchen. I recently pulled it out of the garage, dusted it off and painted it to put in my shop. But let’s get back to Spring…I’m definitely not ready for Christmas again yet! 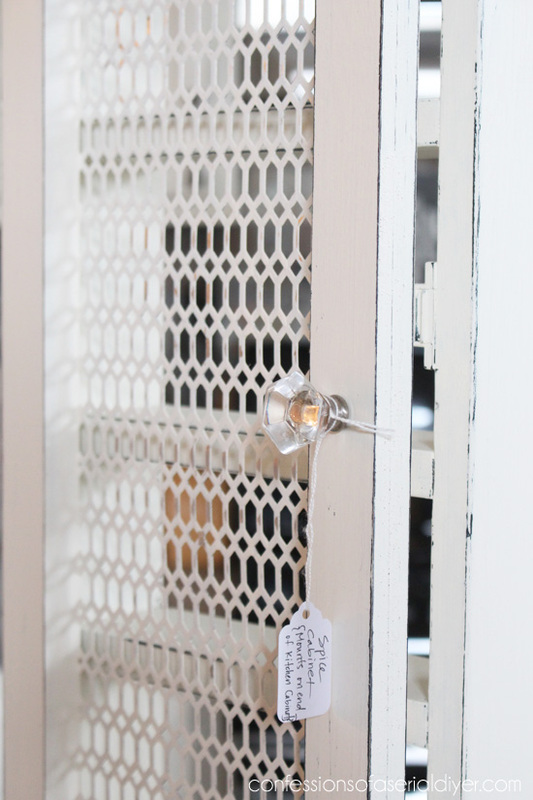 This idea would work on a window like this or a pane window. My hubby purchased this grate online, but I’ve seen it in sheets at Home Depot. I’ve also seen smaller sheets of it at Hobby Lobby. I recently bought a beautiful mirror to hang on my mantel for a change and I can’t decide if I like it. I think I miss the old window. It just has so much more charm! 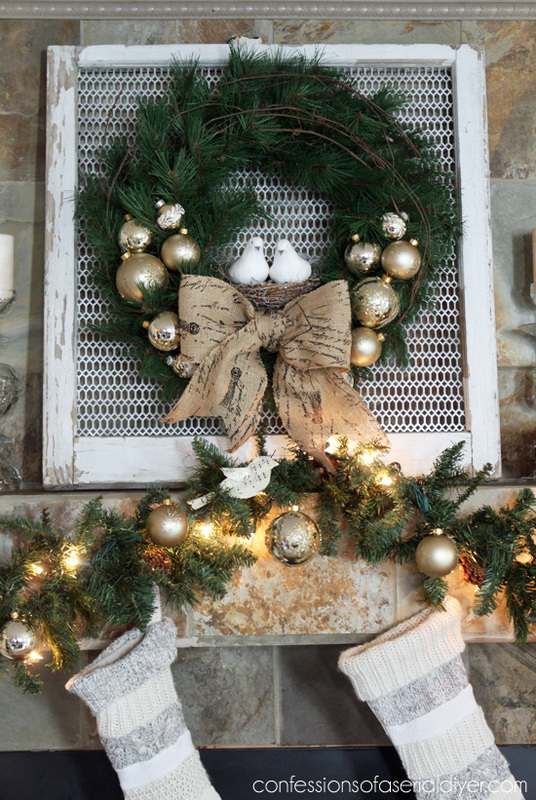 So there’s one more use for an old window… it makes the perfect backdrop for a wreath! Perfect! Love it! Have a great weekend girl! 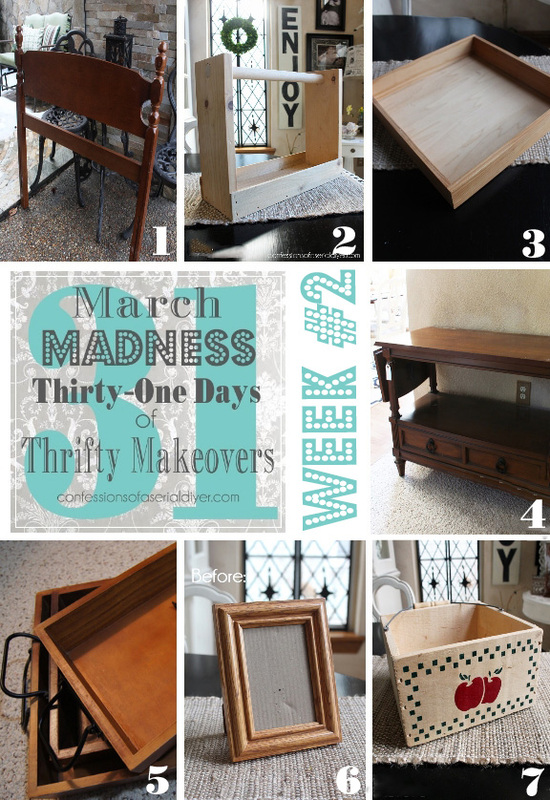 Christy, this March madness has been so much fun! I adore the multiple uses/ideas for the windows!! Thanks always!! A definite improvement from that clam shell window and so simple to do. I love it. I just hate it that March Madness is coming to an end! It’s so much fun to see what cool and interesting (and doable) project I’ll find in my inbox every morning. You are endlessly creative and inspirational…..many kudos. 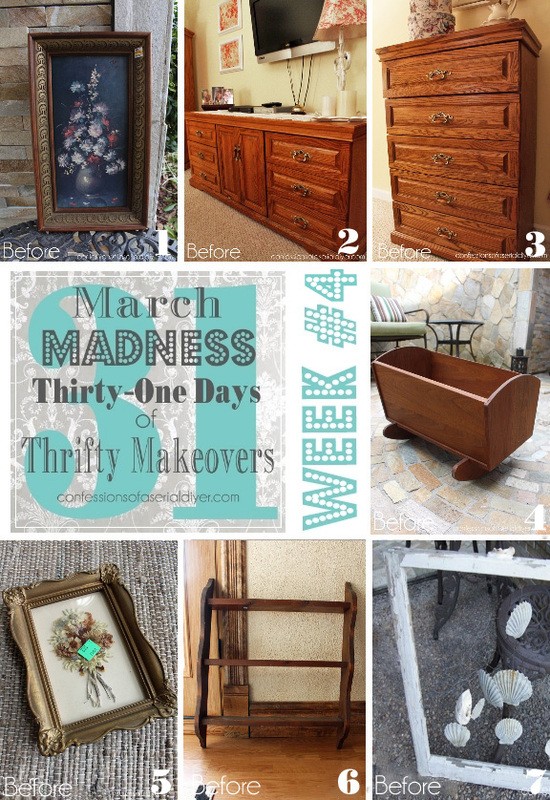 What a fun month!!! Great reworking of a handsome window! 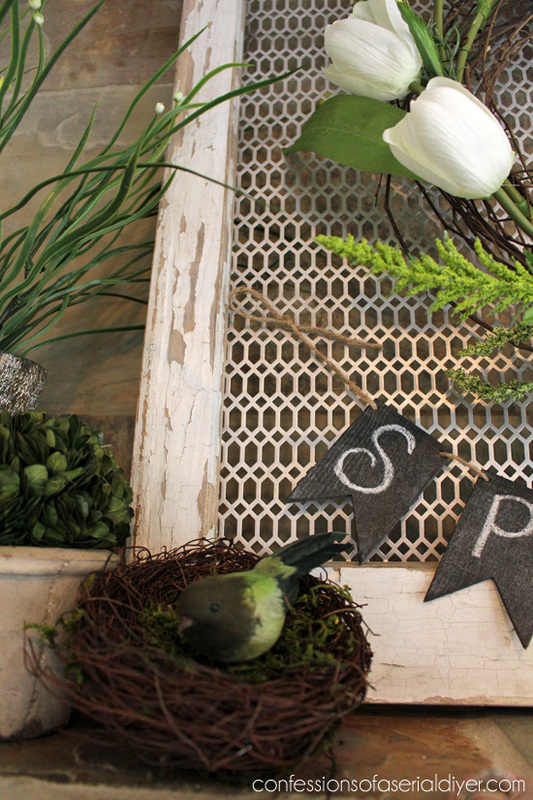 You created a fabulous backdrop for so many decorative uses. 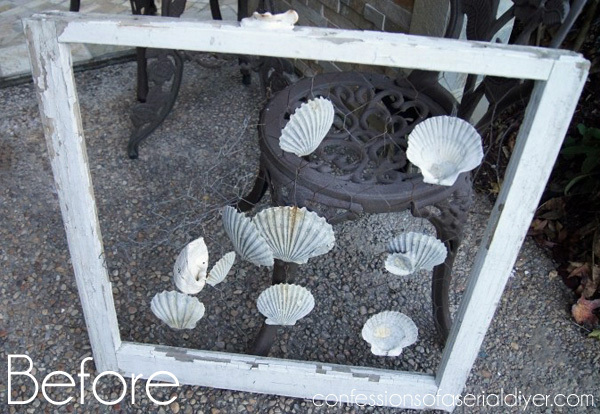 Love your old window! Wow what a deal too! 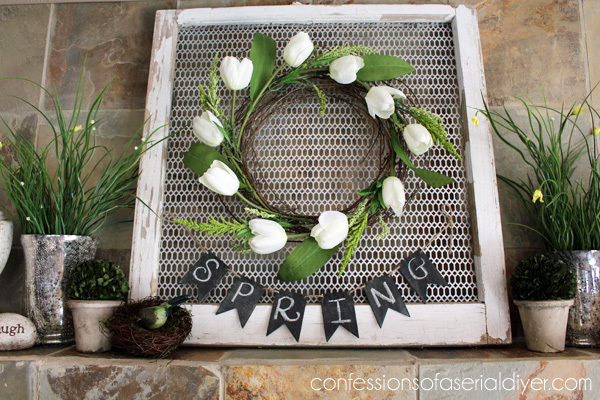 Love your idea for a pretty spring craft:) You know I’m pinning & sharing this one! I remember that frame from your Christmas mantle. 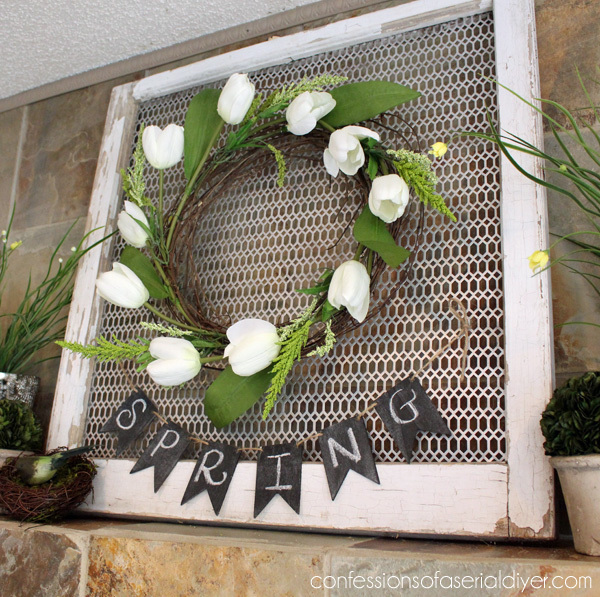 I like the grate you used – prettier than the popular chicken wire. What was up with all those dangling shells? 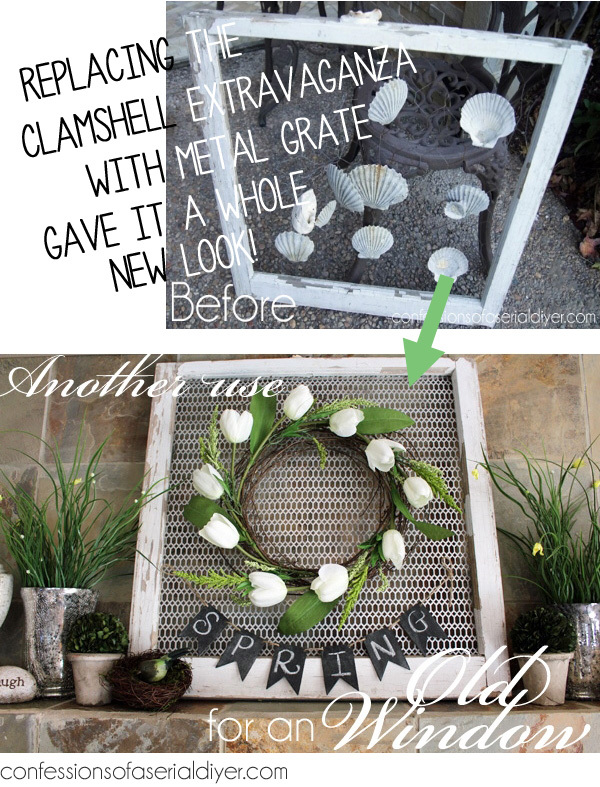 Where did you get the “metal grate” that went into the makeover of the clam window? Hi Joanne! We ordered that in a roll years ago online to cover some vents in our ceiling, and that was made from the leftovers. I don’t know where we originally purchased that particular grate, but I have seen it in sheets at the Home Depot near the lumber section.